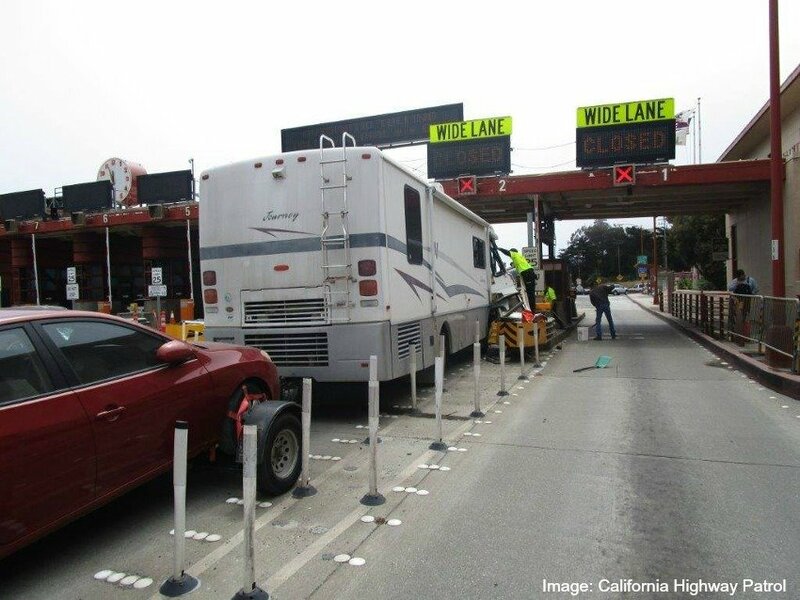 Do you break into a cold sweat when squeezing your RV through highway toll lanes? This unlucky traveler probably did and unfortunately reacted a bit too late when crashing into the Golden Gate Bridge toll lane. The RV was extracted in one hour. The RVer’s drive into the city by the bay didn’t start out so well. 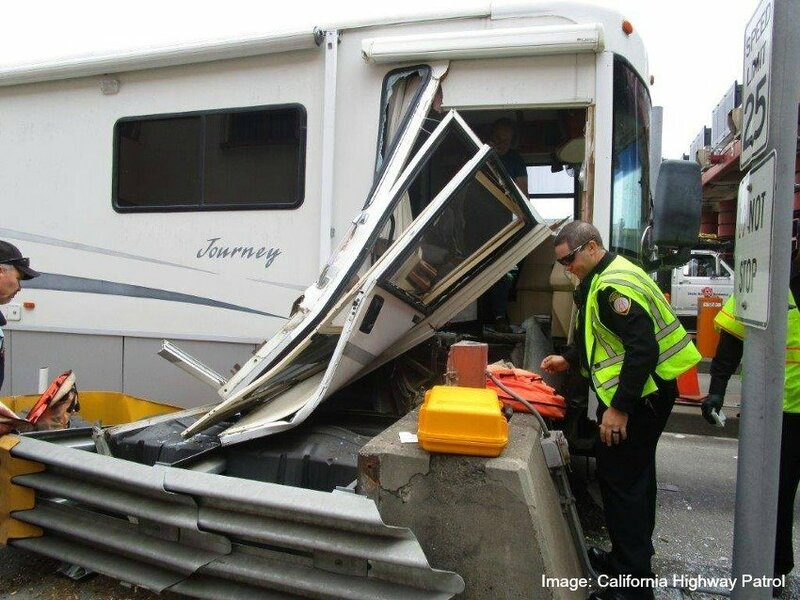 “Luckily, when we arrived on scene it turned out the only reason the occupants were trapped inside is because the only door to the RV was ripped off in the collision and the vehicle was wedged into the toll booth,” stated the California Highway Patrol on their August 2 Facebook post. 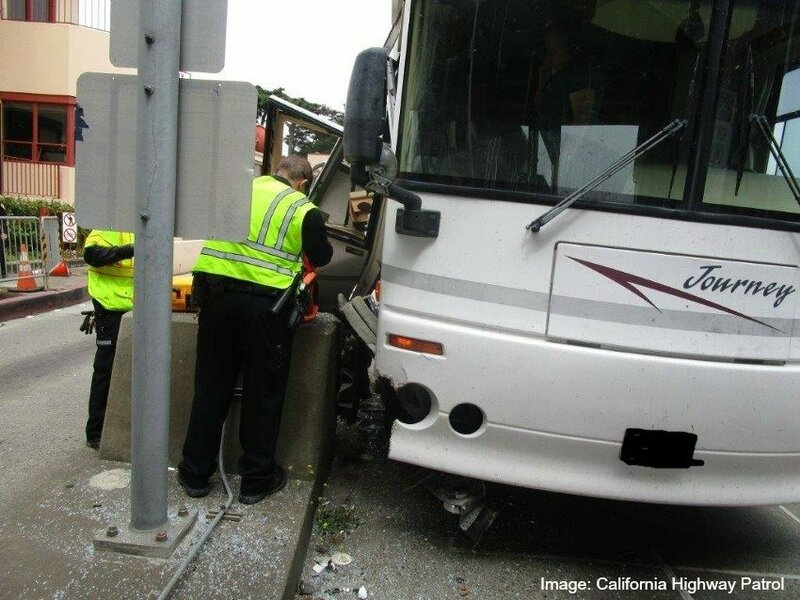 If the damaged motorhome fell into the average RV width of 8 feet 5 inches, it’s not clear why it got wedged into the toll lane. Because according to the Golden Gate Bridge website, the designated wide lane measures 11 feet, 10 inches wide. “When traveling south through the Toll Plaza, use only the two right-hand toll lanes; these toll lanes are wider (11 feet, 10 inches) than the other toll lanes (9 feet, 2 inches) in the Toll Plaza,” bridge authorities advise. Was the driver to blame? The wide lane was being used. 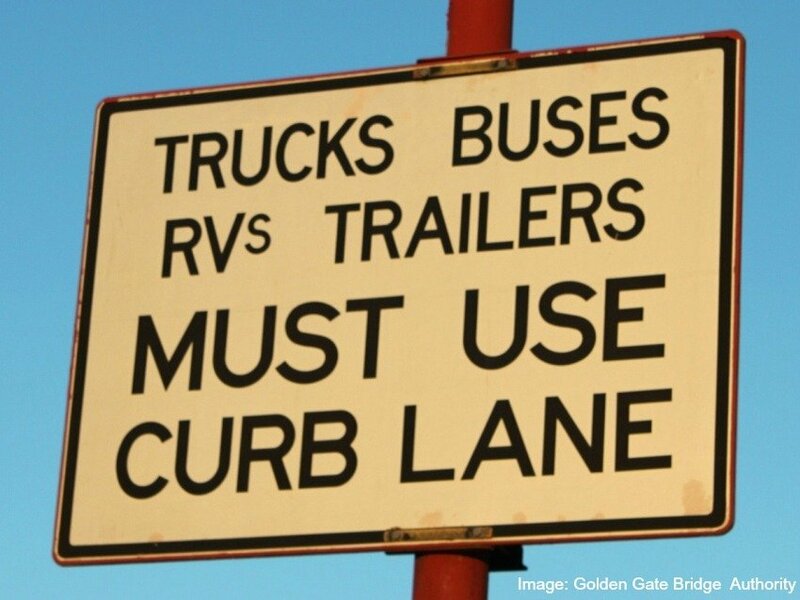 Since your RV probably doesn’t exceed the required width limit, you shouldn’t have anything to worry about when you drive your RV through highway toll lanes, right? Well according to some RVers, not always. “I lost lug nut covers on both front wheels at the same toll both at the same time with a small concrete inverted V directing me thru the booth. It was in Gulf Coastal Texas. Very strange. I had it pretty well centered and stopped. The toll booth operator waved me thru and I picked them clean off.” – iRV2 member Lindsay Richards. Get into the far right lane whenever possible. It’s too bad that there is no photo of the driver’s side of that motorhome, since that would clearly show the lane width and whether or not the driver was in error. Rationally, it seems unlikely that no other widebody vehicle has ever gone through that lane before, so I’ll bet there was lots of room. Even if the motorhome had cleared the concrete, it looks like the car dolly might have hit; it looks at least as wide. If you can’t make it through an 11-foot lane at a toll booth, please get off the road and park the motorhome until you learn to drive! You’re probably drifting into other lanes on highways often (they’re commonly only a foot wider) and avoiding collisions only because the more competent drivers around you are making room. A hint: even when moving forward, the rear view mirrors can be used to see how much room there is between the motorhome and the lane edges on each side, so you can see how you’re doing and learn to judge your lane position from your view forward. and the trailer are sitting on the rumble strips. Its easy to do, look down for a second to grab the toll money, and your 6 inches farther to the right. Unfortunate. Best thing is don’t reach to grab toll money, I never do, my wife gets the toll money out and hands it to me when the person in the booth tells me how much and I don’t hurry after the way they rip-off RV’ers by over-charging for toll fees so I TAKE MY TIME and even give them exact change if its and odd figure. What are they going to do, charge you more? Thank you! My thoughts exactly. Common Sense is a Super Power. Yes, some construction lanes are another matter entirely. 11 feet through a toll booth shouldn’t be an issue. On one trip I noticed that the dump truck ahead of us had very little clearance to temporary curbs on both sides… then I realized that our motorhome was wider! Fortunately, the width across the tires is probably no wider than the truck, and we had no issues. with the curbs. Stupid toll lanes are a waste of money & gas for the nation with the stop & go action, long lines, & paying for people to man the stations plus al the up & wasted electricity. Everyone should do what the Ma turnpike does . They take a picture of your plate & mail you the bill.. SO MUCH BETTER. Now look at the $$ cost with tis one incident. Insurance companies involved on both ends, longer lines, more wasted gas, Ulcers?? Hear…hear. I had a run-in in Sturbridge MA a couple of years ago & somehow sheared my passenger mirror off, Embarassing and expensive. This summer I was pleasantly surprised with the no=stop toll booths. It makes too much sense to use electronic toll billing. The unions will not allow it. I hear Detroit still has a horse shoe maintenance guy on payroll, even if the city has no horses anymore. That’s BS on BOTH counts. Unions have never had a say on employment levels unless it is specifically in the contract. Therefore the employer has also agreed to the employment requirements. Secondly, the City of Detroit, Michigan does indeed have a large “Mounted Unit” used for parades and event crowd control.. As such, a farrier may or may not actually be employed by the city, but at the very least, one would need to be hired to take care of the horses. When viewing the third photo you can clearly see that all of the motor-home passenger side tires AND the car dolly passenger side tire is fully onto the row of white reflective markers on the road. This driver has no clue and was clearly at fault for this avoidable accident. There is one thing wrong with your comment, this was an avoidable collision, not an accident. There is one thing wrong with your comment: avoidable collisions are not intentional, and so they are accidents. Check a dictionary. I did check Merriam Webster. Here is what they have to say: “law :an unexpected happening causing loss or injury which is not due to any fault or misconduct on the part of the person injured but for which legal relief may be sought” Clearly there was fault on the part of the driver of the motorhome who approached the toll booth to fast and ignoring the rumbling of the Bots Dots he/she was driving over on the way to impacting the barrier protecting the tollbooth in the adjacent lane. That’s a convenient and careful selection! It is the fifth definition offered by Merriam-Webster, and applies only in the narrow content of a legal argument. … exactly what happened here. Yes, accidents are usually preventable (like this one), and usually someone’s fault (in this case the driver’s). Yes, this was a CRASH, not an accident. An accident is something which could not have been avoided. This could have been avoided. No matter the type of crash there is something that could have been done to have prevented it. Yes it was a crash… an accidental crash, meaning that it wasn’t intended. “Accident” means an unintended incident, not a non-preventable one. Most accidents are preventable. Having driven over the Golden Gate Bridge with our motorhome (Bucket List item) I can tell you that there is room as long as the driver is paying attention to where he is in the lane. Clearly the driver was to far to the right – which is common with rookie RVers. Had a scrape with a tool booth in Houston, TX. Listed right lane as for over wide loads. Didn’t think that applied to us, having driven through toll booths for 10 years with our motorhome. Wrong, took off the passenger mirror while coming 2 ” from the drivers side post? Should have been better signage. the entire RV diesel lane was shut down by an elderly man driving one of those 1/2 million dollar motorhomes….he had run over and knocked down all the pumps. Cut the turn too close. I hope I have the sense to stop driving when it’s time- my father did not. We finally had to take away all his keys – thankfully before he killed someone. He was not happy. But the fact is he kept haveing incidents that were escalating- the last year of driving his motorhome was up to around $30,000 from 3 incidents. We had to do the same thing with my father, he would drive 15kmh in a 50 zone aggravating everyone around him; a month after having all the brakes overhauled on the camper van he took it back to the same place and asked the mechanic to do the same work. So the guy called my mother and told her, that was the clincher for us, dad had Alzheimer and he was scaring every one in the family, so my brother and I parked the camper in the yard, put it on blocks, removed the wheels and gave back the keys to mother. My dad cried as he was watching us, it was heart wrenching but necessary. It wasn’t much longer that he was admitted in a nursing home.